Jim Davis (born Marlin Davis, August 26, 1909 – April 26, 1981) was an American actor, best known for his role as Jock Ewing in the CBS prime-time soap opera, Dallas, a role which continued until he was too ill from a terminal illness to perform. Northridge, Los Angeles, California, U.S.
Born in Edgerton in Platte County in northwestern Missouri, Davis attended high school in Dearborn, and the Baptist-affiliated William Jewell College in Liberty. At WJC, he played end on the football team and graduated with a degree in political science. He served in the United States Coast Guard during World War II. 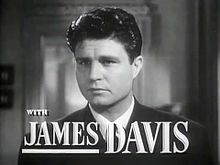 He was known as Jim Davis by the time of his first major screen role, which was opposite Bette Davis in the 1948 melodrama Winter Meeting, a lavish failure for which he was lambasted in the press as being too inexperienced to play the part properly. His subsequent film career consisted of mostly B movies, many of them Westerns, although he made an impression as a U.S. Senator in the Warren Beatty conspiracy thriller The Parallax View. In the episode "Little Washington" of the syndicated television series Death Valley Days, Davis portrayed Mark Tabor, a U.S. Representative from Nevada with aspirations to become governor of the new state. Collectively, Davis appeared 13 times on Death Valley Days. In 1965, Davis played an historical figure, the wagon master Ezra Meeker, who is abandoned by members of his wagon train, who decided to stop the trip to Oregon instead to prospect for gold in the episode "Devil's Gate". In 1967, Davis was cast as the freighter Luke Campbell of Deadwood, South Dakota, in the episode "The Day They Stole the Salamander", a reference to a Salamander Safe. In 1969, Davis played Colonel William G. Butler (1831–1912), who takes revenge on the since ghost town of Helena, Texas, after its citizens refuse to disclose the killer of Butler's son, Emmett. Butler arranges for the San Antonio and Aransas Pass Railway to bypass Helena; instead Karnes City, south of San Antonio, became the seat of government of Karnes County. 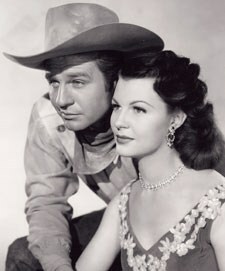 In 1954–1955, Davis starred and narrated the syndicated Western anthology television series Stories of the Century. He portrayed Matt Clark, a detective for the Southwest Railroad who works to bring notorious gunfighters and outlaws to justice. His costars were Mary Castle and Kristine Miller. Stories of the Century was the first Western series to win an Emmy Award. Among the historical figures featured were John Wesley Hardin, Sam Bass, Doc Holliday, the Dalton Brothers, the Younger Brothers, Belle Starr, Joaquin Murietta, L. H. Musgrove, and Clay Allison. From 1958-1960, Davis starred as Wes Cameron opposite Lang Jeffries in the role of Skip Johnson in the syndicated adventure series Rescue 8. About this time, he guest-starred on the syndicated crime drama, U.S. Marshal, starring John Bromfield. Davis made two guest appearances on Perry Mason, as George Tabor in the season-six episode of "The Case of the Fickle Filly", and as murder victim Joe Farrell in the 1964, season-eight episode of "The Case of a Place Called Midnight". He also appeared on the Jack Lord adventure series, Stoney Burke. In 1964, Davis played Wyatt Earp in the episode "After the OK Corral" on Death Valley Days; William Tannen played the part of rancher and gunfighter Ike Clanton in the same episode. Davis appeared 11 times on Gunsmoke and four times each on Daniel Boone, Wagon Train, and Laramie. In the next-to-the-last Laramie episode, entitled "Trapped" (May 14, 1963), he guest-starred with Tommy Sands, Claude Akins, and Mona Freeman. In the story line, Slim Sherman (John Smith) finds an injured female kidnap victim in the woods (Freeman). Dennis Holmes, as series-regular Mike Williams, rides away to seek help, but the kidnappers reclaim the hostage. Slim pursues the kidnappers, but is mistaken as a third kidnapper by the girl's father (Barton MacLane). Sands plays the girl's boyfriend, who had been ordered by her father to stop seeing her. Davis also appeared in an episode of The High Chaparral and in small roles in the 1971 John Wayne vehicles Rio Lobo (1970) and Big Jake (1971). In 1974, he starred as Marshal Bill Winter in a short-lived ABC Western series The Cowboys, based on a 1972 film of the same name starring John Wayne. After years of relatively low-profile roles, Davis was cast as family patriarch Jock Ewing on Dallas, which debuted in 1978. During season four, he was diagnosed with multiple myeloma, but continued to film the show as long as he could. In many scenes as the season progressed, he was shown seated, and his voice became softer and more obviously affected by his illness. He wore a hairpiece to cover the hair he lost from chemotherapy. A season-four storyline regarding the Takapa development and Jock's separation from Miss Ellie was ended abruptly near the end of the season. The writers depicted the couple suddenly leaving to go on an extended second honeymoon when Davis obviously could no longer continue to work. Their departure in a limousine in the episode "New Beginnings" was Davis' only scene in that episode, and his condition was so poor that close watching reveals (based on his unsynchronized lip movement) that he overdubbed his one last line of dialogue. It was his final appearance on the show; he was absent from the final two episodes of season four. He died of complications from his illness while season four was being aired. But Jock remained alive off-screen after Davis' death for the last two episodes of season four and the first 11 episodes of season five; the season five storyline was that he was in South America drilling for oil after taking care of Ewing Oil-related legislative business in Washington, D.C. The fifth-season episode "The Search", which confirmed the character's death in a helicopter crash, was broadcast on January 8, 1982, and contained flashback scenes of the character. A portrait of Davis in his role as Jock Ewing often appeared as a memorial on Dallas after his death. In 1945, Davis wed the former Blanche Hammerer (1918–2009). Their only child was a daughter named Tara Diane Davis (January 15, 1953 – February 9, 1970), who was killed in an automobile accident at the age of 17. Davis later became close to his Dallas co-star Victoria Principal, who had a physical resemblance to his late daughter Tara. Davis died at his home in Northridge, California on April 26, 1981, aged 71. He is interred at Forest Lawn Memorial Park Cemetery in Glendale, California. For his contribution to the television industry, he has a star on the Hollywood Walk of Fame at 6290 Hollywood Blvd. 1952 Gang Busters Capt. Bob Stewart Episode: "The Barrow Gang"
1952 The Unexpected Detective Episode: "Leopards in Lighting"
Dance / Shafer Henchman Episode: "Running Iron"
1955 Cavalcade of America J. L. Armstrong Episode: "The Texas Rangers"
1957 The Millionaire Jim Driskill Episode: "The Jim Driskill Story"
1957 Playhouse 90 Sheriff Episode: "Four Women in Black"
1957–1958 The Silent Service Walter Ruhe Episode: "Boomerang"
Episode: "The Sea Devil Attacks Puget Sound"
Jonus Sawyer Episode: "Two Cartridges"
Episode: "Don't Wake a Tiger"
1958 26 Men Father Diego Episode: "The Bells of St. Thomas"
1958 M Squad Harry Evans / Mickey Seville Episode: "The Case of the Double Face"
Cole Treuitt Episode: "The Castaway"
Episode: "Journey to a Wedding"
1959 U.S. Marshal Harvey Granger Episode: "Federal Agent"
1959 Yancy Derringer Bullet Pike Episode: "Two Tickets to Promontory"
1960 Markham Neal Holland Episode: "The Snowman"
1960 The Tall Man Bob Orringer Episode: "Forty-Dollar Boots"
Jim Genoway Episode: "Trail Drive"
Episode: "Shadow of the Past"
Rudd Basham Episode: "The Candy O'Hara Story"
Episode: "The Eve Newhope Story"
Episode: "The Jim Whitlow Story"
Episode: "The Melanie Craig Story"
1961 The Deputy Trace Phelan Episode: "The Lonely Road"
1961 Coronado 9 Barton Kincaid Episode: "Gone Goose"
1961 Outlaws Steed Episode: "The Brothers"
1961 Gunslinger Jeb Crane Episode: "New Savannah"
1961 The Aquanauts Sam Hogarth Episode: "The Diana Adventure"
1961 Whispering Smith Sam Chandler Episode: "The Homeless Wind"
Sam Butler Episode: "The Gift"
Episode: "The Arrival of Eddie"
1962 Thriller The Marshal Episode: "'Til Death Do Us Part"
1962 Lassie Ed Bates Episode: "Quick Brown Fox"
1962 Stoney Burke Shep Winters Episode: "Cousin Eunice"
1962 Have Gun – Will Travel Al Long Episode: "The Treasure"
Joe Farrell Episode: "The Case of the Fickle Filly"
Episode: "The Case of a Place Called Midnight"
1965 Rawhide Sheriff Sam Jason Episode: "The Greedy Town"
1963 The Donna Reed Show Red Episode: "Pioneer Woman"
1963 Alcoa Premiere Tim Episode: "Jenny Ray"
1964 The Littlest Hobo Danny Kilgarren Episode: "Double-Cross"
1965 The Lucy Show Cardenas Episode: "Lucy Goes to Vegas"
1965 Laredo Sheriff Wes Cottrell Episode: "The Golden Trail"
James Swaney Episode: "One Way Out"
Episode: "Salute the Soldier Briefly"
Episodes: "The Assassins: Part 1 & 2"
1966 The Time Tunnel Col. Jim Bowie Episode: "The Alamo"
Rafe Carson Episode: "River Passage"
Episode: "The Ordeal of Israel Boone"
Episode: "A Pinch of Salt"
Episode: "The Road to Freedom"
1967 Hondo Krantz Episode: "Hondo and the Eagle Claw"
Episode: "Hondo and the War Cry"
Episode: "Hondo and the War Hawks"
1967 Cimarron Strip Clo Vardeman Episode: "The Search"
1968 The Guns of Will Sonnett Sheriff Hawks Episode: "The Warriors"
1970 The High Chaparral Robbins Episode: "New Hostess in Town"
1972 Night Gallery Abe Bennett Episode: "The Waiting Room"
1972 The Bold Ones: The New Doctors Peter Merlino Episode: "Discovery at Fourteen"
1972 The Sixth Sense Anson Beige Episode: "Echo of a Distant Scream"
1972 The F.B.I. Ellis Bengston Episode: "The Runner"
1973 Cannon Henry Rawdon Episode: "The Seventh Grave"
Sheriff Grogan Episode: "The Soul is the Warrior"
1973 Banacek Ed McKay Episode: "If Max is So Smart, Why Doesn't He Tell Us Where He Is?" Roy Johnson Episode: "Shattered Image"
1975 Caribe David Mayfield Episode: "Lady Killer"
1976 The Blue Knight Daniels Episode: "Death Echo"
1976 The Quest Marshal Pulman Episode: "Prairie Woman"
1977 The Oregon Trail J. D. Price Episode: "Evan's Vendetta"
1977 Hunter Raymond Spencer Episode: "The Hit"
1978 Project U.F.O. Earl Clay Episode: "Sighting 4002: The Joshua Flats Incident"
^ a b "Actor Jim Davis dies at age 72 (sic); played patriarch on TV's 'Dallas'". Chicago Tribune. April 27, 1981. Retrieved July 26, 2017. ^ "LED EWINGS IN DALLAS'". The New York Times. April 27, 1981. ^ Rowan, Terry (2015). Who's Who In Hollywood!. Lulu.com. p. 90. ISBN 9781329074491. Retrieved July 26, 2017. ^ "Devil's Gate on Death Valley Days". Internet Movie Database. December 23, 1965. Retrieved July 17, 2015. ^ "The Day They Stole the Salamander on Death Valley Days". Internet Movie Data Base. April 28, 1967. Retrieved July 17, 2015. ^ "The Oldest Law on Death Valley Days". Internet Movie Data Base. Retrieved July 16, 2015. ^ "Laramie: "Trapped", May 14, 1963". Internet Movie Data Base. Retrieved September 23, 2012. ^ "Laramie: "Trapped", May 14, 1963". tv.com. Retrieved September 23, 2012. ^ "'Dallas' Won't Replace Jim Davis," reported by the Associated Press and published in the New York Times, April 28, 1981. https://www.nytimes.com/1981/04/28/theater/dallas-won-t-replace-jim-davis.html Retrieved February 18, 2019. ^ Video interview with Steve Kanaly from 1981: https://www.youtube.com/watch?v=4CqrgO4v48Y Retrieved April 7, 2019. ^ "Dallas Episode Guide Season Four with Larry Hagman and Linda Gray". Ultimatedallas.com. Retrieved 15 December 2018. ^ "Dallas: The Search for Jock". Youtube.com. Retrieved 15 December 2018. ^ Jim Davis, NNDb.com, Retrieved November 25, 2012. Wikimedia Commons has media related to Jim Davis.